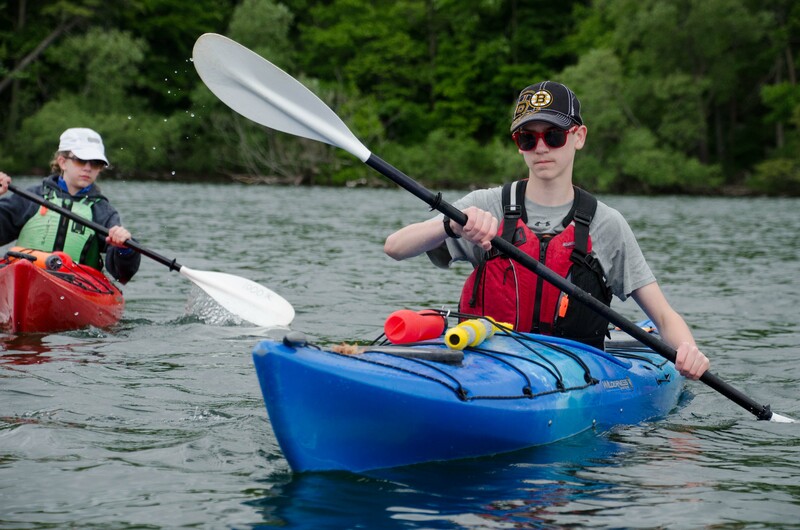 With a loud splash, a kayak tipped over and one very dedicated instructor rolled under the water. Seconds later he surfaced with a rope that had been dropped held firmly between his teeth. The small group of students bobbing around his kayak were in awe, and by lunchtime, everyone had heard the story. Luckily, no one else ended up taking a dip in the St. Lawrence on the second day of Canada’s Coolest School Trip, which started at Mallorytown Landing. As Mrs. Henderson’s Grade 8 students, the winners of this year’s all-expenses-paid trip to Ontario, scarfed down pancakes, they took in some final views from the lookout point before boarding the bus for the next stop on their adventure. Upon arriving in Gananoque, they were greeted by instructors from the 1000 Islands Kayaking. After a quick briefing about safety, life vests and paddles were handed out, and everyone went down to Joel Stone Beach to climb into their kayaks. Many of the students were doing this for the first time and they meticulously copied the instructors, who showed them how to balance the paddle on their head to figure out where to grip it. And then, with a push (and some giggling shrieks at the cold spray of water) the kayaks were on the St. Lawrence. “It’s harder keeping your kayak straight, having more current here, more waves,” said Tristan Friesen, who has kayaked before with his family. The paddling started off slow, but soon the students got the hang of it and even had a little race to see who could reach one of the islands first. As they rounded the shore of an island, a blue heron took off from between the reeds in front of them. Eventually, the kayakers pulled into the quiet bay of another island for a break. “My arms will probably be sore tomorrow, but right now I’m in awe,” said Troy Bartman, class chaperone and vice-principal of the students’ school, Dr. Roy Wilson Learning Centre. It was a particularly memorable day for him as it was his birthday. Lunch on the island was a buffet of build-your-own sandwiches and fresh fruit. Before every meal, the students participate in a gratitude circle and each time two different students are picked to share something they’re grateful for. “It’s a big part of our school culture, that feedback and reflection,” said teacher Adele Henderson. After exploring the island, it was back to the kayaks and on to the mainland, where the bus waited to take the students to Prescott. An hour later it pulled up outside the palisade of Fort Wellington National Historic Site. To the surprise of the students and teacher, one of most interesting stops on the tour was at the clapboard building housing the latrines. The latrines were essentially deep pits under the building with a few slats overtop. Although soldiers weren’t allowed to throw things inside, they regularly tossed in contraband and the latrines have turned out to be a treasure trove for archaeologists. 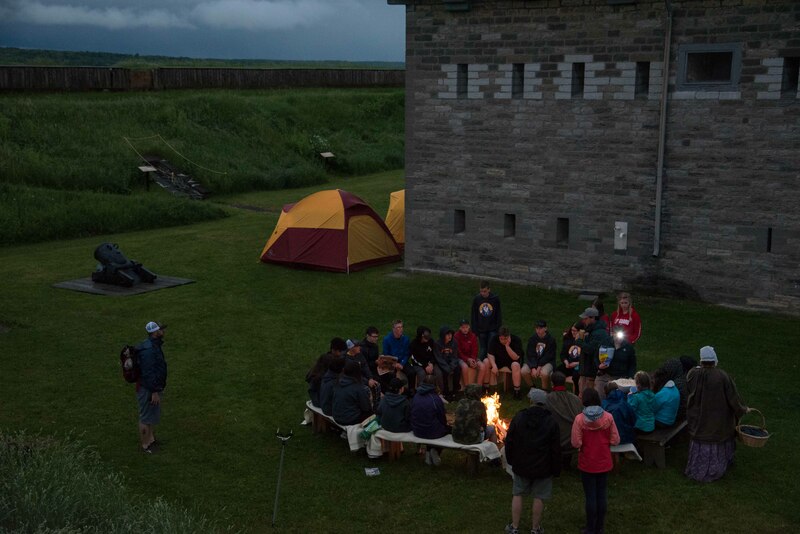 The tour ended in the blockhouse, where students found out that they would be sleeping in the same barracks where the soldiers and their families used to live. In total, there used to be 80 people sleeping on the second floor of the blockhouse and everyone was locked in at night, not only for safety but also as a way to keep people from deserting to the United States. Another fun fact the students learned: children would have slept under the bed. A chorus of “me, me, me” went up from the students as hands shot in the air. 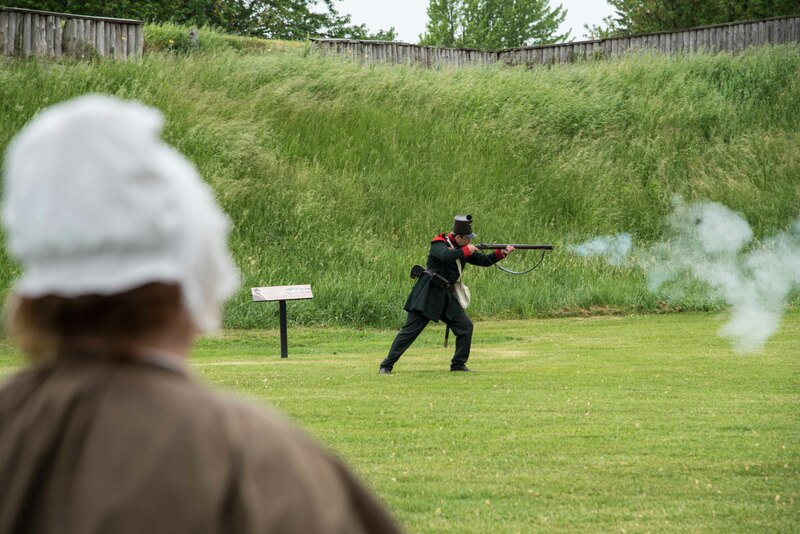 Although no one re-enacted the story of William Tell, students got the chance to see Lawless load up and fire his Brunswick rifle, which let out a loud bang that ripped through the air. That caused some chaos and more than one accusation of “He said the F word!” as spoons and forks were seized. The hearty dinner made up for the chill and drizzle that had crept up from the water and students enjoyed chicken pot pie, soup, bread pudding and custard. Halfway through dinner, Prescott’s mayor Brett Todd paid the students a visit. As dusk fell, they returned to the fort for s’mores around a campfire. Check back tomorrow for more highlights from the trip!